Hardware (1990) - (D/W: Richard Stanley) - Ronin Flix - June 28th, 2018! Here's one that slipped under the radar - but I quickly snagged it up. Looks like it's been remastered from a 4k source and they've added a lossless soundtrack to it. Looks like I will be able to retire my 2009 UK release and I also missed the 25th anniversary edition three years ago. Blu-ray includes a Limited Edition Slipcover and VHS Box Style Magnet while supplies last. 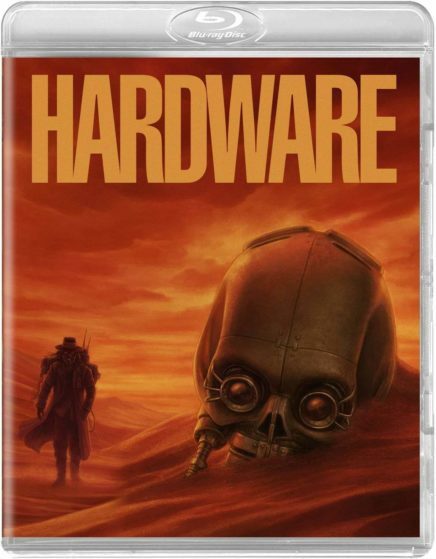 Please Note: The Hardware Blu-ray is available for sale to customers in the US only. Also, the Limited Edition magnet will be delivered in the same box with the Blu-ray. Please use caution when opening the package to avoid damaging the item. This is the uncut version, too. Re: Hardware (1990) - (D/W: Richard Stanley) - Ronin Flix - June 28th, 2018! $35 bucks, huh? Man... these boutique labels really bend you over a barrel and show you the fifty states. Indeed. I got free shipping on it but got charged sales tax. Supplies are limited and it's already $5 off, so I expect it to get bumped up to $40 when their supplies begin to dwindle. They're out in Ventura County, so I expect it sometime this week not counting tomorrow's holiday. Is this the theatrical version, or a different cut like last time? And I just got my shipping confirmation. I misspoke earlier. Their HQ is in Ventura County but their distribution center is in Kentucky, so who knows if I actually get it this week. Maybe by Saturday. We'll see. I watched this last night and it looks and sounds really good. I have the Severin blu but haven't gotten a chance to compare them yet. Shipping notification says it will be here 7/6. I have the 2-Disc (unrated) Special Edition DVD of this movie, it's definitely badass and I'm really glad to have it in my collection, but I don't know that it's a movie I need to double dip for the BD. Love the cover of my DVD (it's as badass as the movie), this BD not so much. The new version. It's also from a 4K source and it's the first time in DTS-HD MA 5.1. It's never been lossless before in any version. I have the 2009 UK one that has a cool booklet. I missed the Severin one. Just got my copy. Will watch after the game. Will be perfect companion piece to this triple digit heat we're having. ^ That's right. The transfer and new lossless track are phenomenal. The new 40 minute Stanley interview is great, too. Definitely one of the best Blu-ray releases of the year, IMO. check out my The Last House on the Left pics in Arrow thread. can't wait to dig into that sucker! Anyone else get this copy?